The IR Repeater Extender System allows you to control devices from behind closed cabinet doors or devices not directly in view of your position. The system floods your entertainment system devices that you want to control with IR signal so you are able to easy control them even if they are hidden or out of the line of sight. 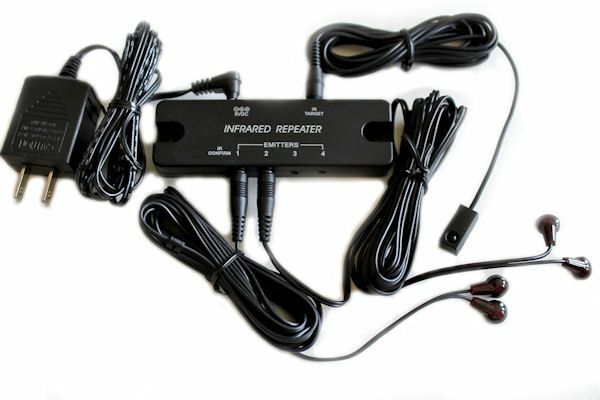 IR Repeater Extender System is made up of a Dual Frequency IR receiver that picks up the signal from your remote, and emitters for sending the signals to the components. In between them they plug into a IR Repeater controller, and a power supply. This is the brain of the system that you hide in your cabinet. As you can see, you can plug up to 4 Dual Head Emitters into the system, which allows you to control up to 8 devices. This is where you plug in the power & also plug in the IR Receiver. The IR Emitters are what puts out the IR signals to what you want to command. They flood the area around it with IR signals that way you can control those components of your entertainment system. Place the Receiver in your desired location. You can attach it to the location with the included double sided tape if you wish. Place the IR emitters on devices that you want to control. (Place them on/by the IR window on the devices) by peeling and sticking the emitters on the device. 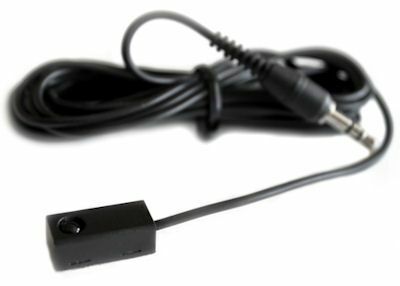 Plug the IR Receiver into the IR receiver jack on the Compact IR repeater controller and plug the IR emitters into the emitter jacks on the controller. Keep your home theater devices behind closed cabinet or closet doors, even when they're in use. The All-in-One IR System makes sure that all of your A/V components receive the commands sent from your existing IR remote controls, even without line-of-sight access. A mini receiver can be placed near your television or mounted somewhere around your equipment cabinet, and this system will deliver your commands to up to 8 individual home theater components. You can link your Hidden IR system to your A/V system in minutes. 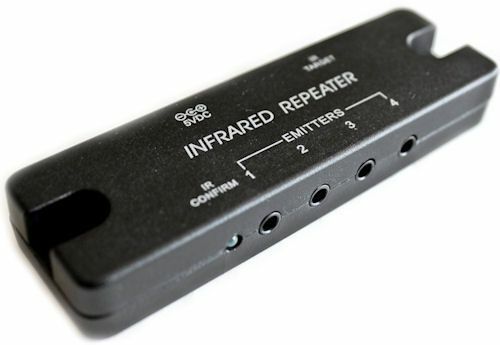 Just place the IR repeater controller in your equipment cabinet, affix one of the four included IR emitters to each A/V device's IR window, and mount the IR receiver where it can receive your IR remote controls transmitted signals. 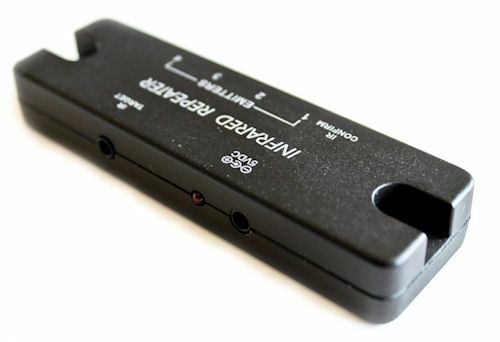 Place the IR receiver on a shelf or on an exposed part of the cabinet; its black color helps it hide beneath equipment of back in the shadows. The IR Receiver does need to be in a direct line of sight from your normal seating position when you'll be using your remote. Use your A/V remote control as usual: The Hidden IR will transmit your command to the correct home theater component, so you'll be able to use your entertainment devices as usual, even though they'll be hidden from view. The 4 emitters included can control many different A/V devices. They're made of material that's transparent to IR light, so commands can still pass directly to individual components if desired. You may stick the emitter over the IR emitter on each component, or place on the shelf in front of the component if you prefer - they're powerful enough to get the signal to the component. 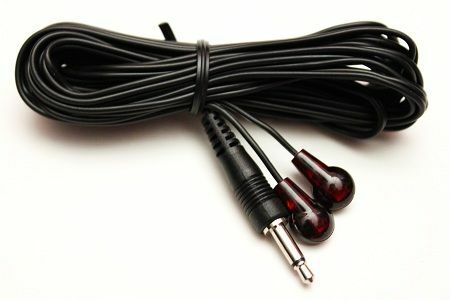 The receiver and each emitter has a 10ft cord so you can easily run emitters to different components. A 120 volt AC to 5 volt DC adapter is included. SPECIAL NOTE: Working with Plasma and LCD Displays Although not designed to reject interference from plasma or LCD TVs, you can work around this by installing the IR receiver eye in an area that isn't exposed directly to the TV screen. Some examples are; at the back of a bookshelf, or on the wall below or next to the TV. Just make sure you still have a direct line of sight from the eye to your normal seating position. A. We have seen that some cable boxes like the SA HDTV DVR's and Direct TV HDTV Receivers use a higher frequency than what has normally been found in USA homes. We have seen that some cable boxes like the SA HDTV DVR's and DirectTV H21 use a higher frequency than what has normally been found in USA homes. For this situation ( If you have any performance issues ) we have already upgraded this to included a Dual Frequency IR Receiver.